A PDF of this information can be downloaded by clicking here. Caudal occipital malformation syndrome (COMS) is also called Chiari-like malformation (CM). This refers to a defect where the skull is too small for the brain which results in overcrowding of the caudal fossa or hind brain structures (essentially the cerebellum, pons and medulla). This overcrowding also results in increased intracranial and intraparenchymal spinal cord pressures resulting in many clinical abnormalities such as excessive itching of the ears and neck, dysmetric/hypermetric gait (exaggerated high-stepping gait), other gait abnormalities, paresis (weakness), pain, vertigo (dizziness), paralysis (inability to move) and even death, if severe enough. It is also important to note that syringomyelia formation or hydrocephalus can be observed as part of COMS or as their own separate disease processes. 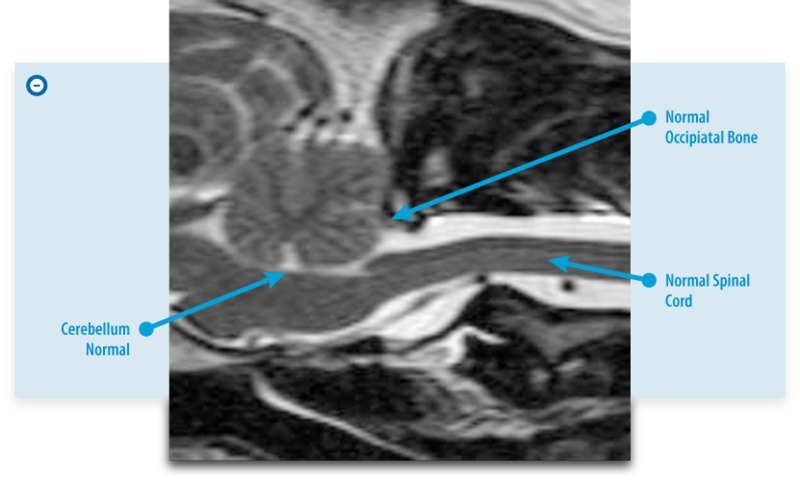 Syringomyelia (SM) basically refers to increased cerebrospinal fluid (CSF) accumulation within the cord. This is suspected to cause elevated intraparenchymal cord pressures resulting in gait abnormalities, paresis or paralysis, and, typically, cervical pain. 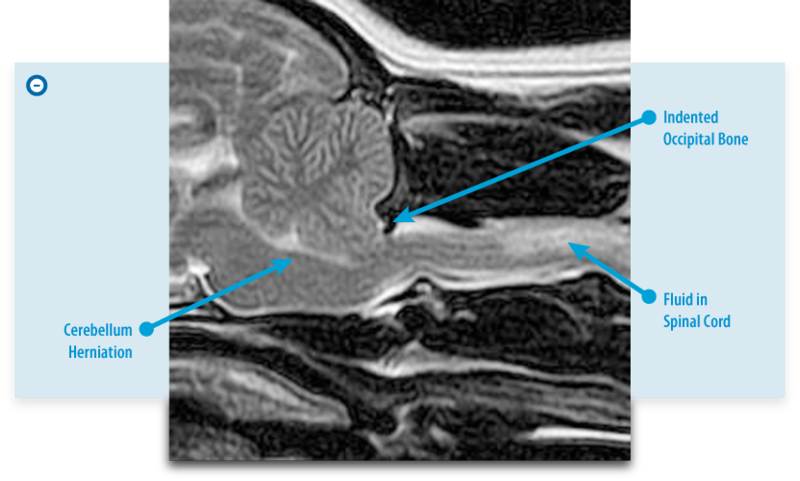 Syringomyelia is typically seen concurrently with COMS but may be a singular problem. Hydrocephalus which is predominantly a congenital problem but can also be acquired, generally refers to abnormal spinal fluid production or absorption within the ventricular system (pathway where spinal fluid flows within the brain and spinal cord). This can also result in increased intracranial pressures and varying clinical signs from seizures, behavior changes, and dizziness among others. What are the signs of SM/CM/COMS? When dogs have disease from these conditions the most consistent signs are neck pain manifested during excitement, activity or being picked up. This neck pain can be severe. Scratching or biting at the head, neck or sides are common and often initially thought to be from skin disease. This too often becomes worse with activity or excitement. Less common signs of this disease include lethargy (likely from a head ache), weakness, poor balance, seizure, seizure-like episodes, and facial paralysis. When syringomyelia develops, it is thought to be a consequence of abnormal CSF flow and CSF pressures within the brain and spinal cord. The abnormal CSF flow and CSF pressure are thought to occur when there is an obstruction of fluid flow from the brain into the spinal cord. The obstruction is caused because the back portions of the brain (cerebellum and brainstem) are out of position or herniated. In addition, the back of the occipital bone is often misshaped or too small, which causes abnormal CSF flow and CSF pressure changes within the brain and spinal cord. This is the origination of the name caudal occipital malformation syndrome (COMS) for this set of problems. Sometimes the fluid spaces in the brain, called ventricles, will be too large (a condition referred to as hydrocephalus) at the same time COMS is noted. This is similar to a condition in people called Chiari malformation, giving rise to this set of problems in dogs that is often referred to as Chiari-like malformation with syringomyelia (CM/SM). Regardless of the name, this condition is thought to be inherited and as a result is preventable through selective breeding. What does it mean to say a physical trait is inherited? Many physical attributes pass through the generations. In animals that are part of breeding stock, certain desirable traits are selected in a breeding pair with the hopes they are inherited and will be conserved in a line of dogs. Unfortunately, certain phenotypes (see below) can be hidden despite the individual having the genotype (see below). When this happens the individual is called a carrier for a particular genotype. A genotype is the DNA sequence of a particular animal. An individual’s genotype is a 50% mix of each parents DNA. A phenotype is the physical attribute of an individual that is a consequence of expressing the genotype or DNA code. An example might be blue eyes or skin color. What breeds are at risk or should be screened for SM/CM/COMS? Cavalier King Charles Spaniel and, possibly, the Brussels Griffon and Japanese Chin breeds. What is the purpose of a MRI to screen for SM/CM/COMS? An MRI is the most sensitive, advanced way to determine those having SM/CM/COMS or “carrier animals.” Conscientious breeders would ideally screen their dogs with MRI and select dogs that did not have SM/ CM/COMS. If the MRI does not demonstrate imaging characteristics associated with SM/CM/COMS, then the assumption is the individual screened is less likely to develop SM/CM/COMS later in life and, perhaps more importantly, is less likely to carry DNA which could pass on the disease to its offspring. It is important to note, the screening MRI is not intended for dogs with clinical signs of the disease. A magnetic resonance image (MRI) is an advanced imaging modality based on difference in water content or proton density in different tissues types in the body. Therefore MRI provides excellent detail in any tissue of the body that contains water. An MRI allows for a dramatically better study of the brain and spinal cord compared to traditional radiographs or CAT scan imaging. It has been used safely and effectively in human medicine for over forty years and in veterinary medicine for over 20 years. What is involved in obtaining a MRI screening test for SM/CM/COMS? Your pet will be under anesthesia during the MRI Screening procedure for approximately forty minutes but you may be at BVNS for two to four hours and, possibly longer, if you are having multiple pets imaged. Intravenous anesthesia induction agents are used and during the MRI, the patient is kept anesthetized by an inhalation anesthesia. We routinely pre-medicate with fentanyl-Diazepam intravenously followed by intravenous Propofol then use Isoflurane inhalant anesthesia for the remainder of the MRI Screening procedure. No intravenous contrast (“dye”) agents are used. What will the MRI scan be able to determine and what disease processes might be missed? The MRI screening is a limited study or “mini MRI” that allows us to evaluate the shape & position of the occipital bone, cerebellum, brainstem and high cervical spinal cord for the characteristics of SM/CM/ COMS. There are many other processes (intervertebral disc disease, tumors, immune, infectious diseases) that can cause signs that are the same as SM/CM/COMS that would not be detected with this study protocol. This particular study does not allow for evaluation of the entire brain, entire spinal cord or for collection of spinal fluid to assess for inflammatory disease processes. However, other diagnostics are available for these purposes. What does the screening study cost and when can it be performed? On Monday – Saturday, a screening for ONE dog can be done as is allowed by our schedule. The cost is $695. On Sundays, costs are $595.00 for the 1st dog and $545.00 for each dog owned by the same owner with a maximum of 5 dogs scanned for SM/CM/COMS screening day. Payment is expected at the time of your appointment. You will be provided a copy of the MRI images on a disc in DICOM format for your records at the time of your pet’s release from BVNS. You will also be provided with a brief report of the MRI findings generated from one of BVNS’s Board Certified Neurologists within 7 days by email or postal mail. How should an owner prepare for the MRI screen and what can be expected that day? No food 12 hours prior to its appointment at BVNS but water at any time. Please provide copies of your pet’s microchip documentation and your pet’s AKC or other breed registry documentation as well as any tattoo information at the time of the appointment. Your pet will need to have minimum blood work performed by your veterinarian within 7 days of its MRI screening at BVNS. Please bring a copy of the blood work with you at the time of your MRI screening appointment. The blood work should have, at minimum, a pack cell volume (PCV), total protein (TP), blood urea nitrogen (BUN/Azostick), and blood glucose (BG) levels. If the results of the blood work are older than 7 days from the day of the exam or are not available then new blood work can be completed for an additional fee of $50.00. Your pet will be examined by a veterinarian who is pursuing advanced neurology and neurosurgical training at BVNS. You will not meet with the veterinarian performing the examination unless there are problems identified during the pre-anesthesia examination or blood work review. A scan will not be performed if there are anesthetic concerns or significant neurological deficits detected during the pre-anesthetic examination. If a scan is not performed then the veterinarian will advise you regarding the problems identified and necessary course of action. This may involve scheduling a neurology consultation at BVNS during normal business hours or it may involve further diagnostics with your primary veterinarian. Your pet will be undergoing an anesthesia for its MRI screening procedure and will need to be observed for a period of time following its anesthesia to ensure it is awake enough to be released into its owner’s care. From arrival at BVNS to release from BVNS, expect to be at our facility between 2-4 hours and possibly longer if you have more than one pet being imaged. Your pet will have small regions shaved on the limbs for intravenous catheter placement and for blood pressure monitoring while it is under anesthesia. As anesthesia carries limited inherent risks, you will be required to sign an anesthesia authorization form prior to MRI screening. This form is available online, here. If you choose to have your MRI evaluated by Dr. Clare Rusbridge, a renowned SM/CM/COMS specialist in the United Kingdom. The owner will be responsible for contacting her, completing the necessary paperwork, and the additional fees for her evaluation.